In Brief: Hike hill trails from a tiny and isolated valley village to reach the Great Wall, first following a narrow trail beside the wall and then passing through an archway to get up on the unrestored end of the Jinshanling Great Wall, a partially-restored stretch with many intact and closely-spaced towers. Some sections slippery and steep. Looking out over the Jinshanling Great Wall. 3–4 hours start to finish over 8–10km. Update: The Gubeikou Great Wall is still closed, so we need to start the hike at Hemp Village instead. Up past Hemp Village we'll find the western gate of the Jinshanling Great Wall park area. 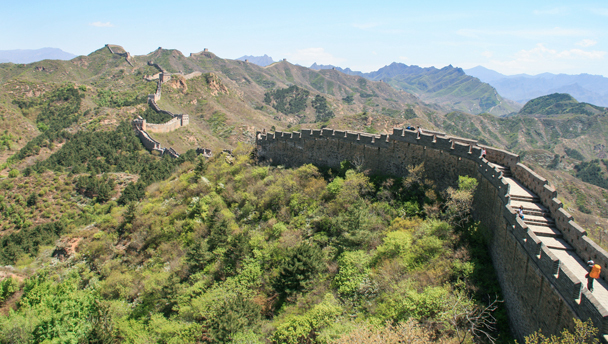 We'll follow the park trails through some farmland and up along a low ridgeline to reach a trail that runs beside the Great Wall, aiming for a great lookout point.. Photos from a hike at the Jinshanling Great Wall.